Samyang 35mm f1.4 AS UMC with Nikon AE fit is a bright, wide-angle lens perfect for portraits, travel and reportage photography. This lens is specifically designed for cameras with a full-frame or APS-C sensors. UMC stands for Ultra Multi Coated, which indicates that the lens has been covered with multi-layered, anti-reflective coating which minimises reflections and increases image contrast. 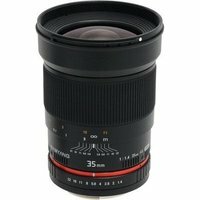 The Samyang 35mm f/1.4 has been designed with great care for the smallest details and perfect style. This applies both to optics and workmanship, which place the lens among the best photographic products available in the world today. This AE edition features chip transmitting all data necessary for light measurement and allowing you to control the aperture directly from the camera. Most importantly, this solution allows you to take full advantage of your flash. All parameters are displayed in EXIF. This lens can only be focused manually.